We all know that fish is something we should be incorporating into our diet on a regular basis, but I often hear that people have a hard time including fish into their weekly meals. Perhaps we like to play it safe and stick to tilapia and salmon, and we need some variety. It could be in the preparation; some people really don’t like the smell of raw fish. Or maybe it’s not your favourite food so you’re not motivated to search for good recipes. Whatever the reason, I encourage you to give fish a chance! On New Years Eve we were out for dinner and one of the courses was a miso marinated black cod. It was delicious, and inspired me to find a similar recipe and adapt my own version. Cod can be a bit more pricey than other fish, but Costco and High Liner sell it for a reasonable price, and it’s MSC certified. 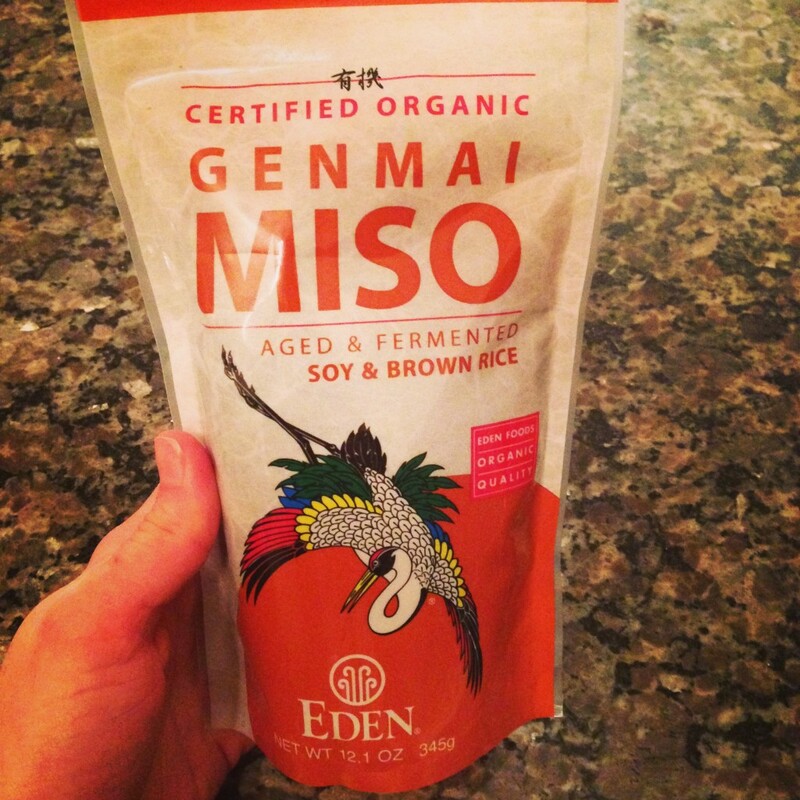 Miso is an awesome healthy ingredient that I would recommend incorporating into your diet. Miso is a high-protein seasoning paste made from fermented soybeans, grains (usually brown rice) and salt. Because miso is a fermented food it has a high content of good bacteria (similar to pro-biotics), which is amazing for proper digestion. Miso will last forever in the fridge. Try and find an organic variety as 95% of non-organic soy is genetically modified. You should be able to find it in the organic section of large grocery stores or at a health food store. Look for white or yellow miso paste as it has a mild flavour, and is most popular for cooking. I’ve also incorporated a noodle recipe into this dish. The sweetness of the tahini dressing really complements the saltiness of the miso, and sneaking kale into the mix is a great way to incorporate raw greens into your diet. This recipe is a healthy choice because it includes: lean protein, healthy fats, healthy bacteria, whole grains and raw greens. Enjoy! Wash & chop kale and place in a large bowl. Drizzle with extra virgin olive oil, salt and pepper and massage oil into the kale to soften (if you find there’s too much kale, you can save some for a salad the next day – unlike other greens, kale stays crispy in the fridge for a couple days). In a small glass bowl combine miso paste with boiling water and mix until miso is dissolved. Stir in ginger, garlic, tamari and sesame oil. Place cod fillets in a glass dish, season with salt & pepper and cover with the miso sauce. Let marinate for 10-15 minutes. While cod is marinating, combine ingredients for the noodle dressing using the same bowl from the miso marinade (you don’t want to waste any miso!). Put cod in the oven, and bake for 8 – 12 minutes. While cod is baking, cook noodles according to package instructions. Add noodles to the bowl of kale, and toss everything together with dressing. 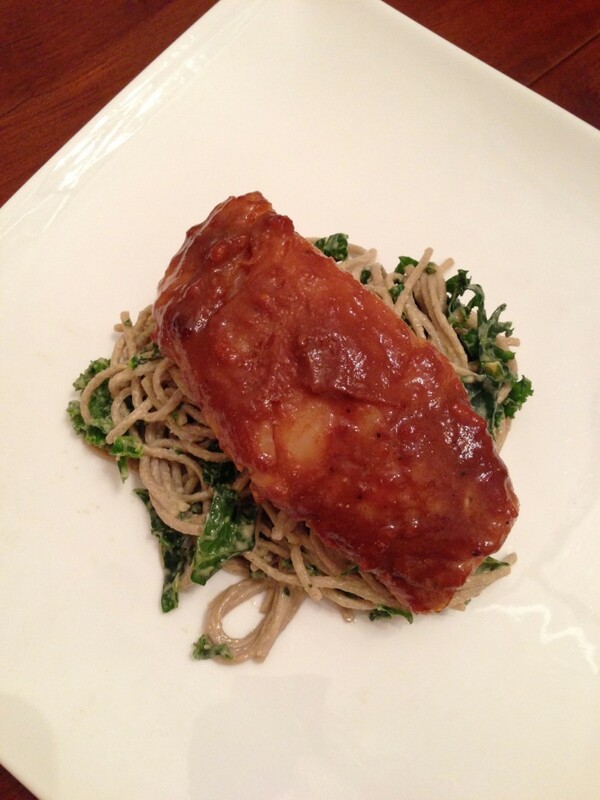 Serve cod fillet on a bed of kale noodles. Garnish with sesame seeds. Do You Have a Meal Planning Routine?